Cold Laser Therapy (also know as Low-Level Laser Therapy, or LLLT) use lower wavelengths of light to help reduce inflammation and promote healing with some wounds and chronic conditions. What does that mean, how does this work? 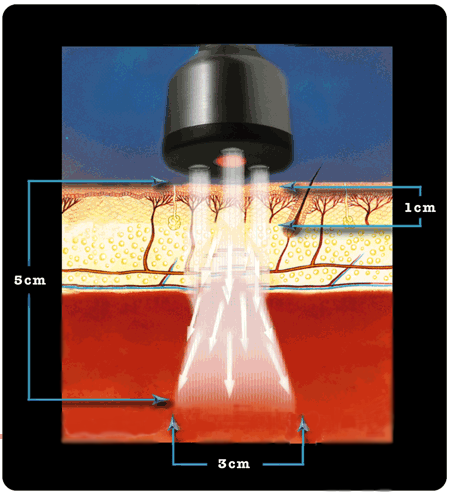 Photomiomodulation – “A form of light therapy that utilizes non-ionizing forms of light sources, including laser, LEDs, and broadband light, in the visible and infrared spectrum.” This type of light is able to penetrate the skin further than a regular light. This light will cause photo-stimulation of the light reactive receptors of the body called chromophores. When stimulated, these chromophores accelerate the body’s defenses to repair and heal naturally. This is similar to how a plant absorbs sunlight and converts it into usable energy, so the plant can grow. Since 1967, there have been over 2500 clinical studies about the benefits of laser therapy published worldwide. Many of these studies are double-blinded, placebo-controlled and have proven that laser therapy increases collagen production, enhances nerve regeneration, increases vasodilation, reduces inflammation, increases cell metabolism, increases pain threshold, reduces edema, increases tissue and bone repair, increases lymphatic response, and increases cell membrane potential. In 2015, the American Animal Hospital Association (AAHA) and the Association of Feline Practitioners (AAFP) released the new Pain Management Guidelines for Dogs and Cats. These guidelines recommend that laser therapy should be part of a multimodal pain management plan for all dogs and cats as laser therapy has been proven to dramatically reduce edema, pain, self mutilation, and acute inflammation in pets. At TLC Animal Hospital, we use the Microlight ML830®. This is a handheld, battery-operated device that emits a beam of light that travels in a straight line for a 33 second interval. Therapy is very passive, does not require any pulses or shocks, and does not emit any heat. It is simply just a beam of light, so the patient feels no discomfort. Each area is treated several times and a full treatment usually lasts several minutes. When you come in for your pet’s appointment, we’ll have a quiet area set up for your pet so they can relax while being treated. We have yoga mats, soft blankets, and smaller beds available to use. We also ensure that your pet, the technician, and anyone else present in the room has the proper eye protection in place before we begin administering the Cold Laser therapy. We have special goggles (or “doggles” for the pets) that are worn while the laser is in use. This handheld laser allows us to do both full body treatments in the case of arthritis patients or focus on small, more specific areas. As mentioned previously, the Cold Laser can help reduce inflammation and promotes healing, so this can help with pain relief as well. It is reported that 75-80% of pets being treated are able to notice an immediate improvement of their condition. Our geriatric patients will benefit greatly because it helps a great deal with arthritis. We can also use the Cold Laser with our surgeries to help them have a faster recovery. Our doctors have set up different packages for our Cold Laser therapy. Depending on what we are using the laser for, the packages are much more cost friendly to you instead of paying for each session individually. If your veterinarian thinks that Cold Laser therapy would be good for your pet, we will get you set up with the best package for you and your wallet. The list of benefits and ways the laser can help is endless. However, just like with any other treatment, it may not work for every patient. Things like coat length, amount of fatty tissue, and even the color of your pet’s skin can prevent the light from reaching the target area. The more the laser has to go through, the less effective it will be. We are more than happy to discuss this and other options to be sure we find the one that is the best for your pet. Many clinics have started a non-evasive therapy with cold lasers for a variety of medical conditions. At TLC Animal Hospital, we use the Microlight ML830®. This is a handheld, battery-operated device that emits a beam of light that travels in a straight line for a 33 second interval. The device is so low energy that it is known as a cold laser. It it non-harmful and uses photo-stimulation of the light reactive receptors of the body called chromophores, because the laser light is able to penetrate deeper than regular light. When stimulated, these chromophores accelerate the body’s defenses to repair and heal naturally. It has been proven through 30 years of FDA studies to increase collagen production, enhance nerve regeneration, increase vasodilation, reduce inflammation, increase cell metabolism, increase pain threshold, reduce edema, increase tissue and bone repair, increase lymphatic response, and increase cell membrane potential. Conditions approved for treatment include: acute shoulder lameness, bursitis, chronic renal failure, cruciate strain, cystitis, lipoma, alopecia, hot spots, lick granuloma, ligament repair, lumbar pain, otitis externa, operative incision treatment, pain management, post ear crop surgery, post cruciate repair, post declaw, pyoderma, sinusitis, tendonitis, ulcerations, and wounds. It is reported that 75-80% of pets being treated are able to notice an immediate improvement of their condition. 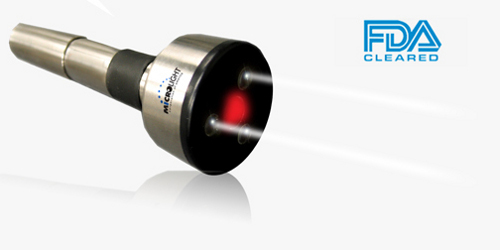 Laser therapy has been proven to reduce inflammation associated with acute and chronic conditions. At TLC Animal Hospital, we often use therapeutic laser therapy for control of severe osteoarthritis, to help ease their pain through reduction of inflammation and increase their pain threshold. We also use it for recovering surgery patients to reduce swelling, inflammation, and promote faster healing by increasing the blood flow at the incision sites. Therapy is very passive, does not require any pulses or shocks, and does not emit any heat, just a beam of light, so the patient feels no discomfort. In general, the longer the condition has persisted, the more sessions are required for a noted response to be seen. Sessions for osteoarthritis are offered at our clinic daily, usually last about 30 minutes to an hour, and are administered by a certified technician. Each session is tailored to the particular need of the animal receiving the therapy. Feel free to speak with the receptionists today to schedule your appointment.